Britannia has long since ruled the waves, the cold ones that surround the island and the radio rock ones. An inadequate metaphor? Probably. Nonetheless nobody can deny the Brit contribution to music in general from the Beatles to Arctic Monkeys. As the music enthusiast I am, I decided to give a look to The British Music Experience in the O2 Arena in Greenwich, one of the biggest covered music arenas in the world. Right when you´re walking the stairs to the entrance you can enjoy a free Gibson photo exhibition, with all the famous hands that have handled this legendary guitar. You can even see a healthy looking Keith Richards and Pete Townshend right before he just crashes it on the floor. 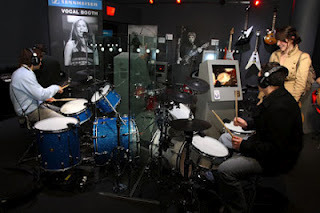 I entered the doors and stumbled into the Gibson Interactive Studio, where you can enjoy a vocal booth, a mixing table and large choice of Gibson guitars, basses, digital pianos and acoustic and electric drums. It's a fully equipped studio that allows you to play, sing, record and mix your own music creations. I strummed a black Gibson and learned some simple chords to a Blur song. Then I learned some tunes on the electric piano and jammed stupidly in a drum kit, thanking God they give people head phones. When I got tired of showing my lack of ability I entered the hearth of the exhibition. Then you enter and you feel like a kid in a candy store, with a vast amount of memorabilia and media ranging from more than 600 items, 3000 videos and pictures, and high tech video touch screens. It's possible to follow the line of time starting in the 50´s blues-rock explosion and ending in the new century British soul revival. Here England music history is just everywhere. The beginnings of hard rock starting with the American blues influenced Cream from Eric Clapton, the Beatle mania hysteria growing into the Sgt. Peppers love generation phase. 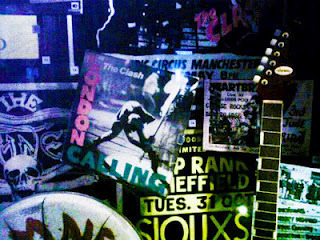 Anarchy in the UK original covers and Johnny Rotten´s slashed jackets mixed with The Clash intervention punk. 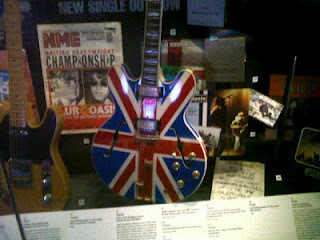 Pink Floyd´s The Wall tour props next to Freddy Mercury`s jacket used in Wembley and Brian Mays homemade Red Special guitar. Stadium filling giants The Who and Led Zeppelin side by side with David Bowies Ziggy Stardust costumes and Elton John's colourful glasses. A stage cape worn by king of darkness Ozzy Osbourne and original artwork for The Rolling Stones lips logo. 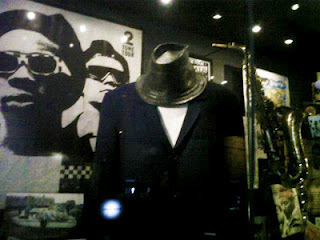 A saxophone from The Specials and The Madness newspaper clothes from the Ska craze of the eighties. The Blur vs Oasis hit battle in front of the Madchester ecstasy fuelled scene. Even the Spice Girls clothes are present right before the vintage clothes used by new British soul divas of the likes of Adele and Duffy. The rest of the exhibition is a series of interactive fun gadgets, a dance booth where you can learn between 12 dances from the last 70 years, instructed by a virtual dance teacher. You can create your own video doing the twist, shaking to the Macarena or even raving alone or with friends. It didn´t seem to have the too-cool to dance dude with glass in hand and only shaking his hand. That's always my favourite dance move. There´s the Hey DJ touch screen where you can flick through Britain's house and dance history and know more about the history of club classics such as Unfinished Sympathy and Block Rockin Beats. There's also some hilarious 90´s fashion clothes in some of the videos. The cherry on top of the Sunday, the piece the resistance or the kicker is the final show. You walk into a black saloon where you're presented with a breath-taking visual and sound show, where you find yourself right in the middle of some of the most legendary and epic concerts in British music history. The powerful sound barrage and overwhelming 3D panoramic screens put you right in the centre of intimate concert gigs and stadium filled epic concerts from the likes of The Stones, Bowie, Led Zeppelin, Oasis, Radiohead, The Clash and many more. In the end you feel as if you went through the euphoria of a hundred historic festivals and concerts, without the inconvenience of lines to the lubes, sweaty people cramming against you and unexpected beer showers. Now that I think about it, they should include that on the show to give it a more realistic feel. The tour finishes with the traditional stroll into the Museum gift shop, so treat yourself with lots of cool stuff. When I finally look at my watch I realized I just stayed in there for 4 hours but it would´ve been more if they didn´t have to kick me out.